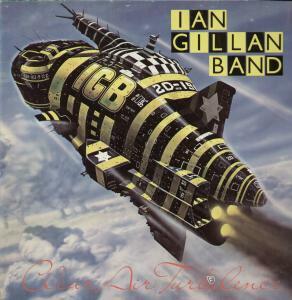 It would not be too much of an exaggeration to call Clear Air Turbulence, the second album released by the sadly short-lived Ian Gillan Band, one of the forgotten masterpieces of Seventies progressive rock. For those who think of Ian Gillan as little more than a hirsute hard rock screamer, even a casual listen to this record may definitely bring somewhat of a shock – and not just because of the vocals. Following his return to the world of music after a series of unsuccessful business ventures, Ian surrounded himself with a bunch of seasoned musicians (including bassist John Gustafson, of Quatermass and Roxy Music fame), and proceeded to surprise his fans by slowly but inexorably detaching himself from his Deep Purple past. Unfortunately, though, rock fans are not always as open-minded as we would wish them to be, and the project folded after releasing a total of three studio albums, plus a posthumous live one. When listening to Clear Air Turbulence, we cannot but regret the demise of such an exciting outfit, offering an incredibly high level of musicianship as well as creativity. The six tracks on the album, which all exceed the five-minute mark, feature complex, multi-layered structures, enhanced by the discreet presence of a horn section, and distinguished by an overall sense of sophistication, a lightness of touch seldom associated with Gillan’s mother band. Even Ian’s vocals, while easily recognizable, never really sound like the original ‘air raid siren’ unleashed on the likes of Machine Head and Made in Japan. However, the ace in the hole on Clear Air Turbulence is undoubtedly keyboardist Colin Towns. Another of the many unsung heroes of the rock world, now a composer of jazz and soundtrack music, Towns joined the band for the recording of this album (replacing original member Mike Moran), and immediately stamped his mark on their music, as well as on the band’s later incarnation – simply called Gillan, and much more akin to Deep Purple in sound, with excursions into outright heavy metal. Weird, spaced-out keyboard sounds introduce the title-track, surging into a crescendo that soon gives way to a manic, bass- and drum-driven riff, and a wildly exhilarating, 7-minute-plus ride, powered by Towns’ sweeping synthesizers. In the middle section of the song, guitarist Ray Fenwick (a veteran of the British rock scene, formerly with the Spencer Davis Group) demonstrates his skills with a slow-burning, emotional solo. Towns is also responsible for the delicate flutes on the dreamy, soulful ballad “Five Moons”; while on the funky “Money Lender” horns take pride of place, with Gillan’s commanding, even aggressive vocal performance somewhat reminiscent of his hard-rockin’ past. “Over the Hill” (my personal favourite, together with the title-track) showcases drummer Mark Nauseef’s impressive skills, as well as brilliant piano and synth in the bridge, and more understated yet distinctive guitar work. The atmospheric “Good Hand Liza” follows, punctuated by Latin-style percussion and spacey synths, and driven along by John Gustafson’s meaty, dynamic bass lines. The album ends in style with another intricate, highly structured number, the romantic “Angel Manchenio”, dedicated to a Gypsy who became Gillan’s blood brother (an intriguing tale, as told by both the lyrics and the liner notes). The song, which alternates slower, almost Latin-flavoured moments with full-fledged jazzy flights of instrumental and vocal prowess, is probably the furthest Gillan ever strayed away from his hard rock roots, and a perfect closer for such a distinctive album. At the time of its release, Clear Air Turbulence was not considered rock enough by Deep Purple fans, and probably not jazzy enough by fusion devotees; moreover, the competition of the fledgling punk scene did it no favours. Over thirty years later, however, it is high time it was recognized as an adventurous, stimulating effort, at times bordering on masterpiece status. It is a sad fact of the music world that, all too often, musicians are much more ready to try new avenues than their fans… I would encourage my readers not to make the same mistake: if you love sophisticated, complex jazz-rock/fusion, do not be put off by the name, and get hold of this album.